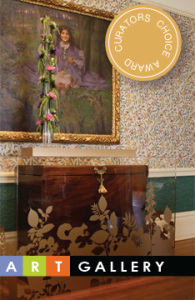 “Design Fit for a King” is an Award Winning Design! We are very excited to share the news that we won the “Curator’s Choice Award” for our floral interpretation at the Art in Bloom event showcase at the Art Gallery of Greater Victoria. We want to extend our gratitude to Plexiklass, Rook and Rose, Brenda Marks – Kravet, and Garside Signs and Displays for all their help, patience and guidance to make this project come together. Without their support we never would have won this award.